I would be remiss in not alerting you to the plethora of Friends & Family deals occurring now or soon on 34th Street. Go here to get Friends & Family flyers for: Macy's, Foot Locker, Footaction, and Ann Taylor Loft. Also, at Gap, now through May 6th, if you buy pants, shorts or skirts you can get a top for 50% off. 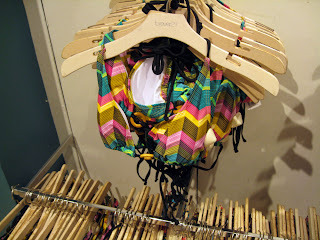 Let's end this week with some adorable, colorful, irresistible, and not $$ bikinis lolling around right now at Forever 21 on 34th Street. They're hanging out on the second floor, right by the inevitably really long line at the dressing rooms. I cannot tell a lie, that is one busy store, so go early or when it's raining cats and dogs for no lines. Mix and match (each under $20), good for those of us who will always need, ahem, larger bottoms. 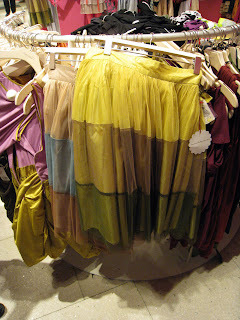 Obviously not bikinis, but rather cute skirts I snapped in F21 last week. Part of the Twelve by Twelve label. Also, BIG news for plus-size gals. I saw on their website that Forever 21 has added a plus-size label, Faith 21, to their collections. Not on 34th Street yet, but hopefully soon. Here are the stores carrying the line. I'm getting too old for Forever 21. I sure would like to see a Forever 29 store open up. Pru - or, as my sister says, "Forever 41." CC - love those prints. Miss Yaya - I understand, sometimes it's a lifesaver, sometimes it's hell. Fash Addict - go, get a bathing suit! Seeker - cute, cute stuff!